It’s no surprise that the creamy dips, greasy chips, fried finger foods, and super-sized sandwiches usually served at Superbowl parties are not diet or health-friendly. The good news is that with a few recipe makeovers, all the flavors of football can be savored without wreaking havoc on your New Year’s weight-loss resolutions. So today, I’m sharing one of the YUMMIEST meatball recipes EVER. These Crock Pot BBQ Meatballs are crazy delicious and still pretty low in Points Total. They are a perfect Superbowl party food that will be adored by weight watchers and non-weight watchers alike. They stay nice and warm and moist in your crock pot, and the spicy BBQ sauce adds such a nice flavor to the meat. And with just a 2 Points per serving, these make a great appetizer recipe. Or, double the size of your meatballs, and serve it as a main dish recipe! 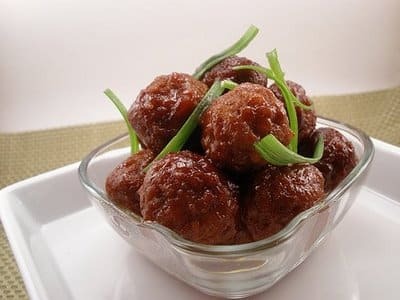 Though not an official one of Weight Watchers Superbowl Recipes, these barbecue meatballs will definitely be a hit with all weight watching Superbowl snackers, and makes a great Superbowl party food idea. In a large bowl, combine the meat, eggs, garlic, parsley, oregano, onions, salt and pepper. In a small bowl, soften the oats with the wine for 10 minutes Add the oats and wine to the meat mixture and mix well – you will need to do this with your hands in order to get everything incorporated well. Coat a baking sheet with cooking spray. Shape meatball mixture into sixty 1-inch balls; place on baking sheet. Bake at 350ºF until cooked through, about 25 minutes. Transfer meatballs to a crock pot to keep warm. Meanwhile, heat barbecue sauce and beef broth over medium-high heat until hot. Pour sauce over cooked meatballs, toss gently and serve. For parties, I just set the crock pot up on the food table, set on warm. I don't know who LaaLoosh is but thank you for sharing your information. Your grocery list looks excellent and so do your easy to follow recipes. I feel like this is one of the most complete and easy to follow weight loss guides that I have ever seen. I can't wait to get started and start losing weight. Thank you and please keep up this website!!!! !